﻿ Uma Sari Cottage by Gamma Hospitality, Bali | FROM $17 - SAVE ON AGODA! "Great location rooms are nice,staff very good." "Beer and food reasonably priced." "Room was a good size and spotless, a.c. worked well room service the best ever, puts some 5 star hotels to shame." "Breakfast ok good fruit plate or juice, choice of eggs, toast and tea or coffee." "Nice pool (11metres), massage best ever, trips reasonably pr..."
Whether you're looking for an action-packed adventure or a relaxing stay, book a stay at the Uma Sari Cottage by Gamma Hospitality. 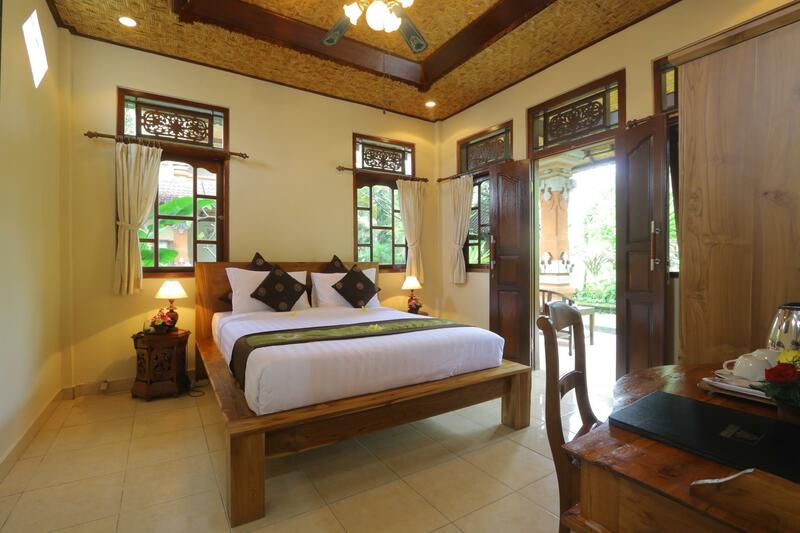 The property is close to Komaneka Gallery, Ubud Market, Museum Puri Lukisan, Ubud Palace, and Saraswati Temple. It offers access to horseback riding, so you can enjoy an equine adventure. It offers hiking, so you can spend a calming day outdoors. For ultimate relaxation, you can take a break from your other activities and pamper yourself for a few hours with a massage. Featuring a garden and an outdoor swimming pool, the Uma Sari Cottage by Gamma Hospitality is fully equipped to make your time away as enjoyable as can be. With a smoking area, safety deposit boxes, and a library, this property offers numerous convenient features to make your stay more comfortable. It has a coffee shop, restaurants on the property, a halal restaurant, and room service, so there is a range of dining and snacking choices. The Uma Sari Cottage by Gamma Hospitality features two floors and 10 bedrooms. There's free Wi-Fi available in all rooms, as well as Wi-Fi in common areas, connecting you to the internet so you don't need to purchase a local sim card or spend on data and roaming costs. The Uma Sari Cottage by Gamma Hospitality provides a variety of useful services, which include daily housekeeping, luggage storage, as well as laundry services. The front desk is open around the clock, so there will always be someone behind the desk to help with any questions that you have. The Uma Sari Cottage by Gamma Hospitality gives you access to numerous transport options, such as airport transfers, taxi services, bicycle rentals, and shuttle services, getting you that much closer to all the must-see destinations around the city. Bangli Bus Terminal is 12.2 km away and Ubung Bus Terminal is 15.1 km away. The nearest airports are Ngurah Rai International Airport (DPS) and Lombok International Airport (LOP), which are 28.5 km and 113.6 km away. The Uma Sari Cottage by Gamma Hospitality features express, private, and 24-hour check in and check out, so you can conveniently opt for the service that best suits you. Check-in is offered from 02:00 PM and check-out is until 12:00 PM. "Fabulous staff, great service, good facilities." Service was excellent! Lady from the reception even tried to remember everyone’s names in a hotel and was always very kind and made you feel welcome. The room was smelling very clean and the pillows and blankets were comfy! Unfortunately the floors specially in bathroom was dirty and had lot of dead bugs. We found at least 6 cockroaches on our two night stay and on the first night my boyfriend woke up one growling on him... Location was great!! The taxi drivers of the place are simply the Best Tourist guides. Lovely place . Typing from the airport and already Miss all of them . We booked a deluxe room for 2 nights, but the hotel took our room to someone else. When we asked that we did not book this room type. The hotel could not answer us except the apology. In addition to this, other matters are good. We would stay again if we returned to Ubud. Jalan Bisma is a quiet street, easy walking to the main area and surrounded by rice paddies and ducks. The staff are friendly. Breakfast is happily provided right up until 11 am plus. No night time restaurant when it is quiet, but great inexpensive restaurant just 2 minutes walk further from town - also has great fish spa at same place. Good pool, comfortable bed, great setting far from the madding crowd. Would not recommend this guesthouse. There are hundreds of others in Ubud that are much better. I had a standard room on the second floor, fan only. The ceilings are thatched and not insulated properly, so you can hear the voices and noise from the neighboring room very clearly. There are open screens above the windows so you can hear roadside traffic and the music from the adjacent pizza restaurant. The only positive is that there are abundant toiletries and a nice instant coffee assortment pack provided. The pool is rather nice. The staff is not very helpful and were very reluctant to let me change rooms. My initial room was very noisy, and the second was less so, but still noisy and poorly insulated. We stayed in the standard room and did miss having a fridge. Also you had to plug the kettle in next to the bed. But it has a pool, good breakfast and friendly staff. A good basic budget option in a quiet street within easy walking distance to the main street. Fabulous staff, great service, good facilities. Nice pool (11metres), massage best ever, trips reasonably priced. Beer and food reasonably priced. Room was a good size and spotless, a.c. worked well room service the best ever, puts some 5 star hotels to shame. Not enough electric sockets in room but can get by. Breakfast ok good fruit plate or juice, choice of eggs, toast and tea or coffee. Rooms around pool which worked well. About 10 minute walk to main beach. Lots of eating choices close by. I stayed here 2 years ago & it needs a bit of updating. The owner approached me & apologised that things weren't as they should be and told me that he's renovating the accommodation in the quiet season. Although right in the heart of Ubud and on a road just parallel to ultra busy Monkey Forest Road, it Uma Sari is quiet and has rice field views, something harder and harder to find in Ubud as so much of the fields have given over to hotels and shops. there is easy access to lots of great restaurants, fantastic shopping and the temples and palace. The staff are very friendly and most speak English well. They can help you with any need such as arranging day trips to the tourist sites nearby or renting a bike or motorbike. The deluxe rooms are big, clean, comfortable with air-con and large private balconies. They also have cheaper, smaller rooms that are decked out nicely, but without air-con (with fan) for those who do not need it. The restaurant made good breakfasts and can cook lunch or dinner as needed. The pool is small, but deliciously cool since they keep it aerated and clean. We loved it and would stay here again. The view of the rice fields, relaxed and private feel. I had the most wonderful time staying at Uma Sari. The staff are smiley and sweet and quick become good friends. The view of the rice fields from the room are outstanding. Equipt with a lovely swimming pool, overall the Uma Sari is a peaceful,relaxing place to stay. I book for 3 nights and then stayed for another 3. The staffs are very friendly and helping. Not only the information they offered, they also drive customers to places nearby for free. Uma sari is not on the main street of Ubud. It took 10 mins to Ubud market, but in exchange, you can enjoy nice view and quiet environment. Besides, the wifi is good. It's on quiet street, 10 mins walk to Monkey forest and nice pool. Not recommend this hotel. We stayed 2 nights and i couldn't sleep really well because the noise from guests next door. The wall is not sound prove at all, you can hear everything from the next door! Warm shower didn't work. And We got double charged for our transportation to Lembongan. Normally it is 450,000 rupiah but we paid 800,000 rupiah to hotel service. Rooms with big terraces and view at rice paddies. Hotel provides bicycles and motor bikes for rent. Rooms are very clean, the staff is excellent. Beautiful green water pool is surraunded by tropical flowers and plants. But water in the pool is very cold. Me and my husband stayed only for 1 night in here and this is the first time for us. Basically this hotel, really nice and professional, even this is a small hotel. The staffs are friendly and helped us a lot with information. Breakfast was good and the surroundings are really quiet. We will stay in Uma Sari again when we go to Bali next year.. Helpful and super attentive staff, cozy rooms, flowers everywhere, pool, meditation station, overlooking rice paddies! we loved our stay at uma sari! the staff were extremely helpful and super attentive. we received welcome drinks, and were treated like royalty. the place is super cute and has an amazing garden with pool and meditation station and views of rice paddies. the rooms are cozy. the only thing that would make it better is if the shower hose had an attachment on the wall to make it easier. we loved the place so much we kept asking for more nights. it is a 5 minute walk from the main part of town. Super attentive staff, amazing surroundings, and cozy rooms. we loved uma sari that we booked another stay here after our trip to lovina. the place is super cute and has an amazing garden with pool and meditation station and views of rice paddies. the rooms are cozy. the only thing that would make it better is if the shower hose had an attachment on the wall to make it easier. we loved the place so much we kept asking for more nights. it is a 5 minute walk from the main part of town. Quiet, great surroundings, very attentive staff, cozy rooms. ok! we really loved our stay at uma sari, as we booked yet another night here! the staff were extremely helpful and super attentive. we were treated like royalty. the place is super cute! they place fresh flower arrangements everywhere - even on the ground! it has an amazing garden with pool and meditation station and views of rice paddies. the rooms are cozy. the only thing that would make it better is if the shower hose had an attachment on the wall to make it easier. it is a 5 minute walk from the main part of town. We really loved this place - it was one of the best places we ever stayed in on our SEA tour. Breath taking, tranquil surroundings. Beautiful decor and fresh flower petals everywhere. Pool, meditation area, and quiet. Rice paddy views. And most of all, super attentive staff that are at your beck and call! Definitely stay here! good rooms, very obliging staff, excellent outlook across rice Padys. airport pickup arranged before we left home - mkt value. all staff very obliging - happy, helpful, jobs done and concers attended to. helped book and plan itinerary in ubud. great outlook from rooms - serene paddy fields . quiet street, but felt comfortable at all times.